This S&R Style Harness Vest comes in three sizes. 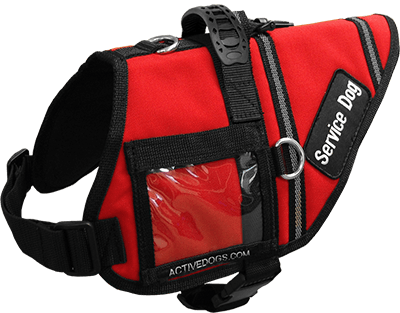 The vest is made of a tough and highly visible 1000 denier nylon/urethane coated fabric that is padded and lined for your dog's comfort. There is a Hook and Loop closing, clear vinyl pocket for your ID. The reflective straps across the back and sides of the vest provide added visibility at night. All seams are double stitched and bound with nylon web for a beautiful, finished look. On top of the vest, there is a heavy welded D-ring for attaching your leash/lead and allowing you to use the harness for pulling / carting work with your dog. There is also a plastic swivel snap. The handle is made of molded vynil over poly webbing and is box stitched to the vest for added durability and comfort. The chest strap has a two-way adjustment. The girth strap is adjustable and allows your dog the mobility that it needs to work, run, and jump. Vest has a smaller vertical vinyl pocket, will fit an ID. The vest comes with 2 patches (regular, not specialty patches) of your choice, one on each side. Additional patches and any specialty patches can also be purchased. There is no extra charge to have them sewn on for you.